Landsknecht Cap …what should a man wear underneath his hat? Maybe you don’t want to wear your wool hat directly on your head, it can be itchy but it also makes the hat dirty with all that human sweat penetrating the hat for day after day. As a women it’s usually pretty simple, you just wrap a head floaty, where a haube or something else similar, depending on what kind of German class you belong to. Lately several people have asked me for what a man properly should wear underneath his hat and it makes me so happy because I’ve tried once to convince my husband into wearing the awesome period caps you sometimes see in paintings, underneath his hat. He wasn’t as amused as I was, and to his defense, he more often puts on his Landsknecht outfit more to please me and make me happy …he definitely prefers early period clothing. So I let him wear his hat as he please, with either a Schlappe or a coif underneath, it’s not the end of the world. But for those who might be a bit curious about what a guy can wear underneath a hat, I present the cap, a neat little haube for men and i only have seen it being worn once so far and it made me excited to see that little cap on this guy (thank you Sir Måns! ), because paying attention to details is such a satisfying feature and I applause all those who do it. 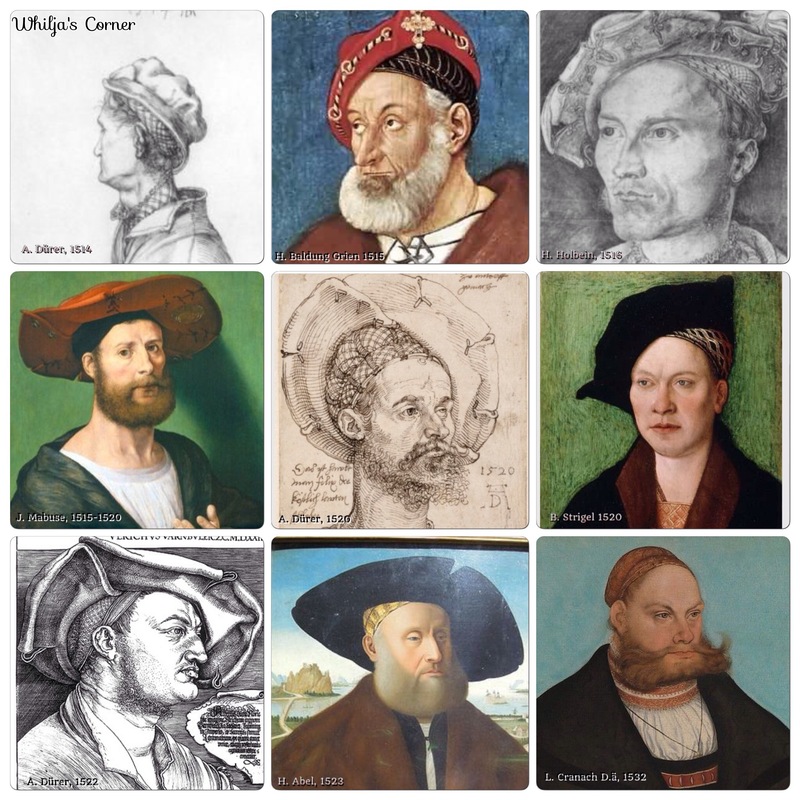 Here is a small sample of different caps worn by men in Germany during the 16th century, and maybe I make one and just hope I’ll someday may convince my husband to wear it. This entry was posted in Accessories, Hat, Landsknecht and tagged cap, hat, haube, Landsknecht. Thanks for pointing to this, it is quite interesting and I have never noticed it before. However it looks like it is mostly the choice of the wealthier class. Am I right that those are two types of head covering? one is some type of cap (or maybe a scarf tied like “woman’s turban”) and the other is apparently a hairnet? I have noticed that in the movie “Flesh+Blood” from 1985, the Captain, when without helmet, is wearing the cap and the main character Martin is wearing the stylized hairnet in the pirate bandana style in the beginning of the movie. can you please share more insight into this head covering? PS: Many thanks for the info shared on your site, very kind and professional from you! It was quite a while ago since I saw Flesh and Blood 🙂 and I can’t unfortunately say that I have analyzed the content on what type of research they may have done for the movie. If I find something more or any information I’ll get out of my experience, I’ll make sure to post it on the blog.